The Archbishop of York became embroiled in a heated television debate with Piers Morgan this morning over gay marriage. Archbishop John Sentamu appeared on the ITV show to promote his reasons to vote remain in the upcoming EU referendum but the topic soon moved on to the Orlando massacre. MailOnline columnist Mr Morgan, 51, asked the religious leader about the church's views on gay marriage following Sunday's attack, which took place in a gay club in Florida. 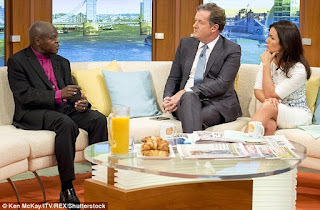 Dr Sentamu, 67, was forced to deny that the church was homophobic and insisted that he has lots of gay friends - and he was particularly unimpressed when Mr Morgan compared homophobia to racism. The MailOnline columnist said: 'What if I said to you that you can come to this country as a Ugandan born man but because of the colour of your skin you can only have a civil partnership, you can't have a real one. Dr Sentamu insisted that while he is not in favour of gay marriage due to his religious beliefs, he is not homophobic and he wants to support the LGBT community. He said: 'I've got a lot of gay friends and they see me as a friend, as someone who wants to support and defend them against homophobia. But the archbishop replied: 'You can still have your view, in terms of teaching the church's position on marriage and at the same time be intolerant of those who are homophobic. The unspeakable in pursuit of the unspeakable etc.